Many ski-loving holidaymakers are still heading off to the slopes unprotected more than two years since Michael Schumacher suffered his near-fatal accident in the Alps. Foreign & Commonwealth Office (FCO) and ABTA leaders say that many Britons still go skiing without the appropriate travel insurance or equipment. They warn that the UK's near-one million skiing tourists should safeguard themselves on both matters. This is why ABTA has launched a new guide detailing what kit snowboarders and skiers require before they hit the slopes. Physicians claim that former Formula One driver Schumacher's life was only saved because he was wearing a helmet. - 1 in 3 people still snowboard and ski with no helmets. 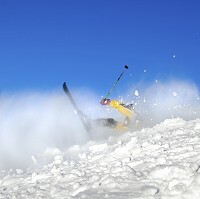 - Over 3 in 10 winter sports tourists head for the slopes with no appropriate travel insurance. - 7 out of 20 skiers with children aged at least five years-old leave with no cover. Getting travel insurance is a sensible precaution with so many accidents happening on the slopes every year. Ski-related travel insurance can cover holidaymakers for the damage or loss of skiing equipment. It can also compensate skiers should the slope close or if they suffer off-piste accidents. The FCO's Brian Jones is urging skiing holidaymakers to safeguard their heads and bank balances this season. Mr Jones, who oversees consular services across northern Europe, wants them to invest in appropriate travel cover and a helmet. He said that too many boarders and skiers face major injuries and massive medical costs every year. ABTA's chief executive Mark Tanzer says that skiing holidays are a great favourite among UK holidaymakers. But he says that many tourists have already suffered accidents this season. Mr Tanzer says this emphasises the need for appropriate insurance and kit. He calls the price of medical evacuations "incredibly expensive". Skiing tourists can take simple measures to prevent an enjoyable and exciting trip from turning unpleasant, Mr Tanzer says.